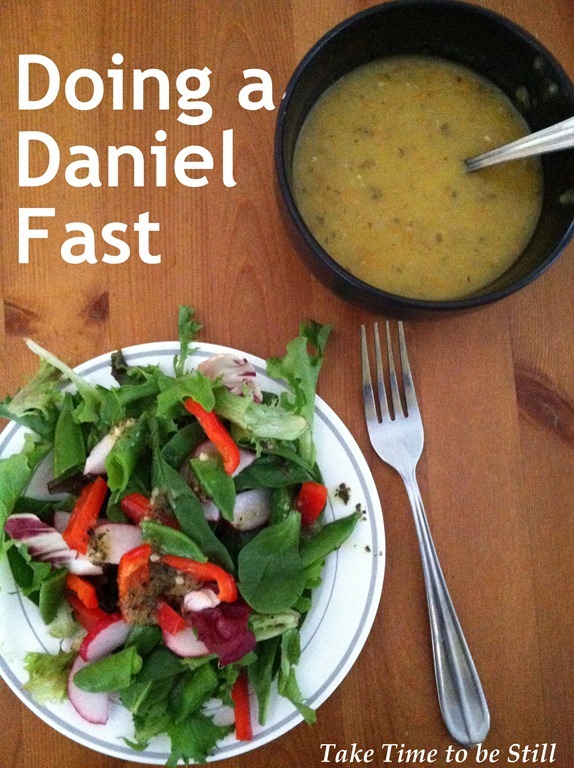 Last Saturday marked the final day of my 21-day Daniel Fast. It has been an exciting time of spiritual growth and renewal, and today I’d like to share a few practical things I learned along the way, in case you are interested in doing a Daniel Fast for yourself! Begin your fast knowing that the ultimate focus and outcome is spiritual, rather than physical. If you just want to eat more healthy or lose some weight, then you’re really just dieting, not fasting. A true fast should include a spiritual element of prayer, confession, and Bible study, asking God to speak to you as you focus on spiritual nourishment, rather than physical nourishment. Have a spiritual goal in mind while fasting. Maybe you need wisdom before making a big decision, maybe you need direction in some area of your life, maybe you want to begin to have more consistent time in the Word, maybe, like me, you want to use the time leading up to Christmas or Easter as a time of reflection and spiritual preparation. Set a goal or focus, but also be prepared for God to show you new things along the way! Find a devotional plan to use during the time of fasting and get a journal to write down what you’re learning, your prayer requests, etc. The Ultimate Guide to the Daniel Fast has daily devotionals to use during your fast, or use another book or Bible study method of your choosing. I read through the devotionals in the book, but I also did the Easter study from Good Morning Girls. She Reads Truth is another good source of Bible study plans. Figure out your menu ahead of time and shop for necessary ingredients. While I had some of the ingredients I needed, because I couldn’t use things with added sugar or leavening agents, refined flour, etc. I had to go to the store to buy a number of ingredients, and making a meal plan ahead of time helped me to make sure I didn’t make unnecessary trips to the store because I didn’t have one or two ingredients. Decide ahead of time how to fit your fast in with your family’s meals. This is a hard one if your family doesn’t want to participate in your fast or if they are not used to eating lots of unprocessed, whole grain products. When I made up my meal plan, I tried to find ways that I could make things easier by making dishes we normally eat, and just modifying them a bit for myself. That way I didn’t have to make two separate meals every night. For example, our family likes tacos and nachos. I was able to make those once a week and just have them without the chicken for myself (just beans and brown rice with lettuce, tomato, avocado, cilantro, etc. ), or I made spaghetti and meatballs, but used whole grain spaghetti (which we eat normally), and just skipped the meatballs for myself, and made sure the tomato sauce didn’t have sugar. The kids were happy for the most part, and my husband was really supportive and decided to just eat whatever I was eating for dinner, rather than asking me to make a separate meat for him. Make things as easy as possible so you’re not tempted to “cheat.” Make sure you have a good variety of things available, especially fresh fruits and veggies. Cut things up ahead of time so they are readily available with minimal work. At the beginning of each week I made a big batch of soup for lunch, and then I would just reheat a bowl every day along with a salad for lunch. That way I knew exactly what I was going to eat, it was easy and quick, and it allowed me to focus on other things. If you have any special dietary needs, you are pregnant, or you are nursing, check with your doctor before beginning your fast, or adjust the fast as necessary. For example, because I was nursing and needed extra calories (and didn’t want to risk any “supply” issues as baby is only a few months old), I chose to include seafood in my fast as an extra source of calories and protein. That’s all I can think of for now! If you’re planning a Daniel Fast soon, please leave a comment and let us know! This entry was posted in Meal Planning and Recipes, Mommy Mondays and tagged Daniel Fast, Meal Planning and Recipes, mommy mondays by Julia. Bookmark the permalink.